Kullu: After facing stiff objections from animal activists, Maheshwar Singh, sitting MLA and chief caretaker of Lord Raghunath temple in Kullu, has received a huge setback after the Municipal Council of Kullu denied permission to perform the animal sacrifice at the International Kullu Dussehra festival. 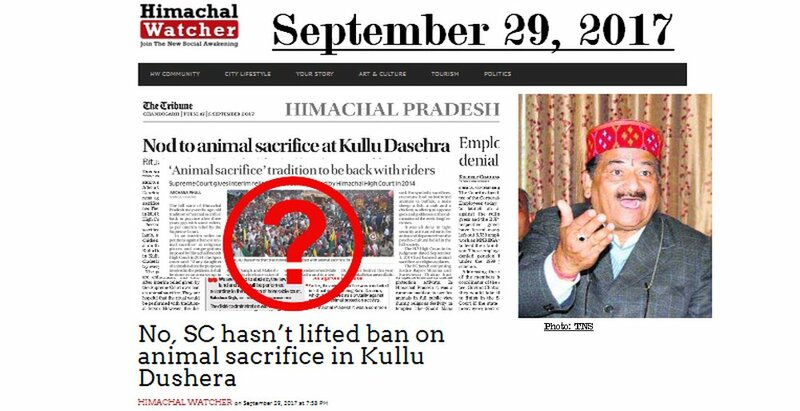 Himachal Watcher (HW) had published a story titled “No, SC hasn’t lifted ban on animal sacrifice in Kullu Dushera” on September 29, 2017. In this story, HW debated the legal status of the event based on the orders passed by the apex court and the communication with activist Sonali Purewal of the Kasuali-based People For Animals (PFA) organization and her counsel, advocate Vandana Misra. Surprisingly, no other media highlighted the issue or debated it. The organization had alleged that the district administration does not fulfill any of the mandatory guidelines issued by the court in relation to animal slaughter, even for a ritualistic purpose. Hence, the act of slaughtering an animal at the festival would have become contempt of the court orders. HW had also written to the Deputy Commissioner of the Kullu district to bring the matter to his attention. HW asked him to provide an official statement over the fulfillment of all necessary conditions for the sacrifice ceremony. The DC did not respond to our inquiry and avoided giving any statement over the controversial matter. However, on October 5, the Kullu MC denied permission to set up a temporary slaughterhouse at the festival. The Supreme Court has clearly provided for a compendium of various acts and agreed to allow animal slaughter remaining within the law and court guidelines. There is a list of official permissions and procedures defined by the court in order to slaughter an animal for food. These guidelines also apply to animal sacrifice in religious rituals. For instance, in order to slaughter an animal for any purpose, one needs a licensed stun gun, licensed butcher, permission from Municipal Commissioner Kullu, acknowledgment letter from AWBI, veterinary officer-in-charge of the animal sacrifices etc. The court had also directed to inform animal activist Gauri Mulekhi regarding any such animal sacrifice. There is no licensed slaughterhouse in Kullu district. The nearest slaughterhouse is located in Shimla, said Ms. Mulekhi. The MC said it took up the matter with the Animal Welfare Board of India (AWBI) and activist Ms. Gauri Maulekhi. The matter was enquired by this office with the Dy Director of Animal Husbandry and Health Departments. It has come to the notice of this office that there is no slaughterhouse here at Kullu that is established as per the law/rules. Further, there is no provision under the Prevention of Cruelty to Animals Act 1960 and amended Slaughter House Rules 2001 for granting permission for animal sacrifice in a religious function except in a licensed slaughterhouse. Earlier, this year, the MLA had announced that, on a petition filed by him against the ban, the Supreme Court had permitted animal sacrifice at this year’s festival in its interim orders passed on April 10, 2017. It was announced that this year, the sacrifice would be performed in the traditional way. 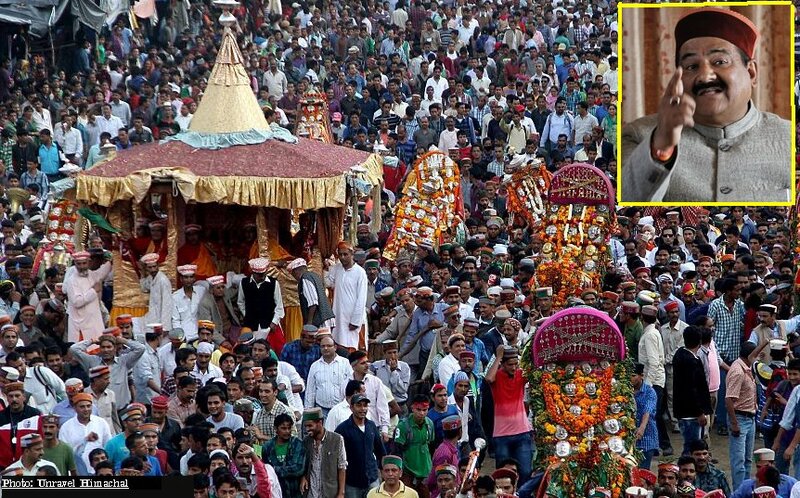 Prior to the blanket ban imposed by the Himachal Pradesh High Court in September 2014 on a petition filed by the PFA, the animal sacrifice was performed on the last day of the festival in the traditional way every year. Apparently, now there would be no legal animal sacrifice at the Kullu Dussehra or in any part of the district. It is to be seen whether the MLA and district administration would dare not to comply with the court orders. Will HP Govt’s newly launched ‘women safety’ App actually help in emergency situations?